Tears welled up in the eyes of Vasundhara Raje, the Chief Minister of Rajasthan, as Namita Gokhale reminisced of the days before she was the Chief Minister, yet used to flock to the Jaipur Literature Festival and attend sessions sitting on the ground. The reason that drove her, Raje told us later, is also the essence of the festival: the love for books. This thought flagged off a 5-day literary extravaganza which not only involved writers, but people from all spheres of life, be it media, cinema, politics, art or business. The common objective was to have a dialogue, exchange of ideas, of experiences and meeting their other half – the readers. The Booker prize was the flavour of the day, with the 2016 Booker winner Marlon James (for A Brief History of Seven Killings), the shortlisted Sunjeev Sahota and the longlisted Anuradha Roy talking about their respective books and writing. James continued on to discuss, in a separate session, his life as a gay black Jamaican writer and how his Booker win had begun bringing huge shifts in his life and writing. Another session, Readings: In Other Words, highlighted the need for translations from regional Indian languages for English. The afternoon turned political with a spirited discussion on the image of Pakistan as a failed state. The panelists discussed the false emergence of a ‘new Medina’ and the need for shifts in Pakistan’s policies to back to pre-Zia times. Representing Bollywood, Karan Johar, whose book An Unsuitable Boy will be published soon, sparked up the evening when he talked about how he dealt with his childhood as an effeminate child and his thoughts and views of Section 377. The second day begun with a lot of laughs echoing through the venue, all because of Margaret Atwood’s crowd puller session where she talked of zombies, spacesuits and dragons, among other things. She talked of her book, The Heart Goes Last, and how the concepts of utopia and dystopia have evolved in literature right from 19th century. Coomy Kapoor, Mihir Sharma and other panelists talked of the horrors of Emergency. They discussed its consequences on contemporary politics and whether there was a possibility of it happening again. The evening ended with Barkha Dutt, whose recent book This Unquiet Land has been making waves, expressing her views on how media handles news, on beef politics, intolerance and war reportage. She also talked candidly about being sexually abused, being in a violent relationship and the challenges of being a woman. 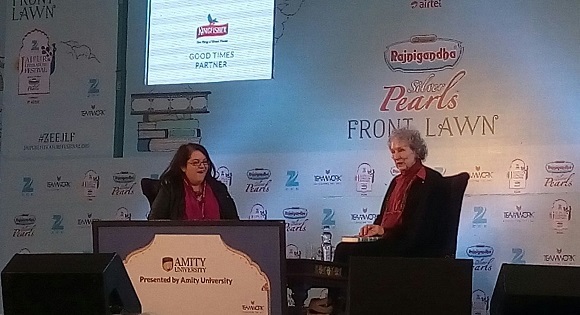 In the session titled ‘The Global Novel’, Margaret Atwood went against the general notion of TV triumphing over literature by arguing that a novel takes you to the mind of characters and lets you live their lives, which visual mediums of entertainment fail to do, and that is why the novel remains the premier medium of storytelling. The funny Meera Syal spoke on not-so-humorous topics, when she talked of the challenges of surrogacy, parenting, being the daughter of immigrants and how there always remains an overwhelming sense of being Indian in spite of her being a British citizen. Colm Toibin, author of The Testament of Mary and Armistead Maupin narrated their experience of being young and gay in their respective countries. They talked of the challenges they faced while they were growing up, and also that the hardships India faced made theirs seem incomparable. Salman Khurshid made a lot of noise at the release of his book The Other Side of the Mountain, defying the popular notion that the Congress party had almost been wiped away from national politics. While he praised AAP for being democratic and bringing a political change of scene, he also mentioned that it was time for Congress to prepare a program for the next elections and to have conversations with people. 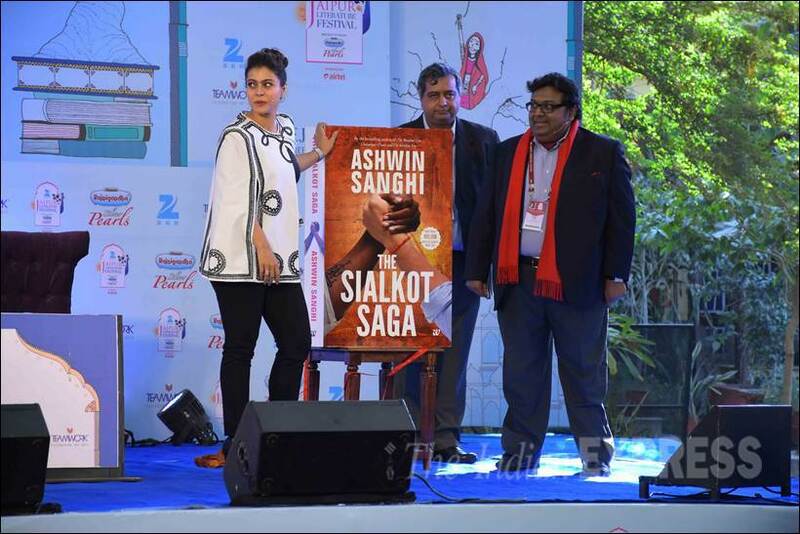 Bollywood actress Kajol released Ashwin Sanghi’s new book The Sialkot Saga, during which she commented that she preferreded easy reading to award winning books for the sheer pleasure of reading. Sanghi injected a note of humour in the proceedings by speaking of how difficult it was for him to get his first book published – ultimately, he had to do it under a Western-sounding pseudonym! In true Dan Brown style, an anagram of his own name – Shawn Haigins! The fourth day of the festival saw the largest crowd at the venue, with there being barely any space to move around from one session to the other! The day progressed with sessions on the history of Partition and how the violence affected so many people who are still afraid of remembering that period. On parallel lines, the session Eyeless in Gaza included discussions on the atrocities by Israel on Palestine and how the world must collectively come together to resolve the conflict. Women from 3 South Asian countries talked of sexual violence on women in Bangladesh, Sri Lanka and Kashmir. They talked of how determined they were to not let the perpetrators get away with their crimes and that they were creating ripples through their activism and what legal challenges they continue to face throughout. The concluding day began with an informative session, ‘Farthest Fields’ which included discussions of the effect of World War 2 on Indian subcontinent and how it created ripples in the social structure of the country. It was followed by a riveting session of ‘Trial by Media’ wherein Madhu Trehan, Shoma Chaudhary and Avirook Sen discussed how media had influenced Aarushi murder case and how it continued to be irresponsible in self censorship. Shoma also put the onus on viewers for not paying for news services and making the media houses go to corporates. The final day also saw a huge crowd attending a session which included prominent regional writers talking about how and why they returned their awards. They instigated a dialogue with the audience, explaining their actions and why the importance of writers mattered in the country. The final session saw a dramatic entrance by Laxmi Narayan Tripathi, whose story can be read in her book Me Hijra, Me Laxmi followed by an equally candid conversation wherein Laxmi rejected the idea of an English word for Hijra. She also mentioned that though her community was ostracised by the society, she still considered herself to be a part of that society and wanted no reservations for transgenders.